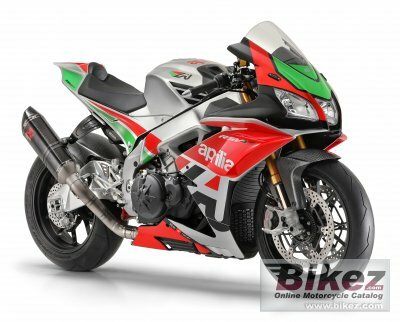 2018 Aprilia RSV4 FW-GP. Picture credits - Aprilia. Submit more pictures. The Aprilia Racing Team uses its experience in the top world competitions to create the new �Factory Works� versions of the award winning Aprilia RSV4. An extraordinary range of top performance bikes, for track use only, produced and sold directly by Aprilia Racing: the racing division with 54 world titles will also provide first-hand assistance. Fuel system: Injection. Airbox with front dynamic air intakes. Variable length intake ducts controlled via ECU. 4 Weber-Marelli �48-mm throttle bodies with 8 injectors and latest generation Ride-by-Wire engine management. Driveline: Primary: Straight cut gears and integrated flexible coupling, drive ratio: 73/44 (1,659) . Final: Chain: Drive ratio: 40/16 (2,5) . Frame type: Twin-spar adjustable aluminium frame, with castings and pressings. Rear suspension: Twin sided aluminium swingarm. Ohlins piggyback shock absorber with adjustable spring preload, compression, rebound damping and length. Ask questions Join the 18 Aprilia RSV4 FW-GP discussion group or the general Aprilia discussion group. Bikez has discussion forums for every bike. View comments, questions and answers at the 2018 Aprilia RSV4 FW-GP discussion group. You can sign up for e-mail notifications when other riders answer you. If you have extensive experience with the MC, please send us a review. If you consider buying this bike, you should view the list of related motorbikes Look at photos. Compare technical specs. And check out the rating of the bike's engine performance, reliability, repair costs, etc. You can compare the rating with other bikes.